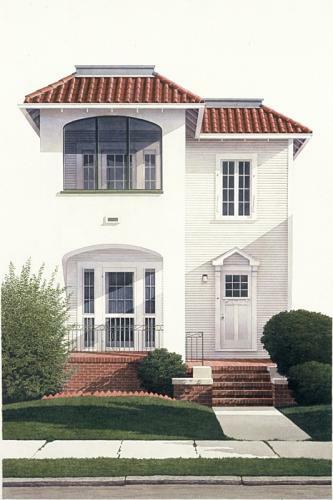 An exhibition of photo-realist watercolor paintings of New Orleans from Stephan Hoffpauir, the architect-turned-fine artist, just opened at Cole Pratt Gallery and continues through April 25, 2010. The opening reception is scheduled for Saturday, April 3 from 6 to 8 p.m. Ready for a little after-work drink on that porch? 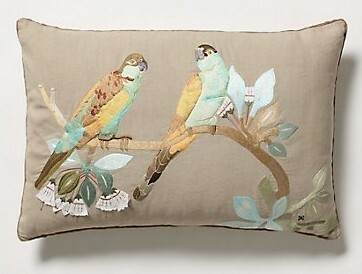 For the screened porch sofa, how about this oh-so-lovely embroidered pillow designed by New Orleans artist Shelley Hesse? Click here to see all of the Hesse offerings at Anthropologie. The charcoal pillow is yet another thing that reminds me of Mrs. Delany and Her Circle. But this post isn't supposed to be about living with books or the personal warmth they bring to a room. We've covered that territory before, and Annie Kelly's new edition, Rooms to Inspire in the City -- with the cover we all flipped for -- has a really nice chapter on the subject. 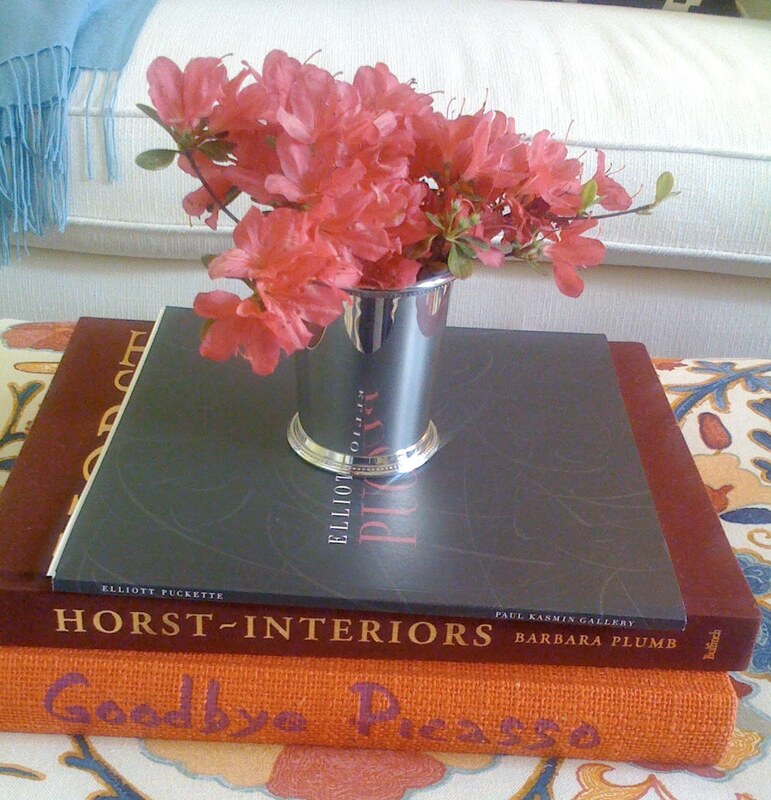 I'm currently stuck on the differences between old book jackets and contemporary versions. 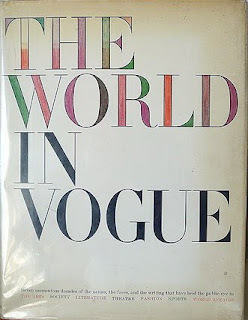 In this past post I contrasted the mid-20th-century dust jacket for The World in Vogue with the design for the second edition released in 2009. Decades ago, subtlety ruled. Now we're living with the Cult of Celebrity, so personalities tend to make the covers. 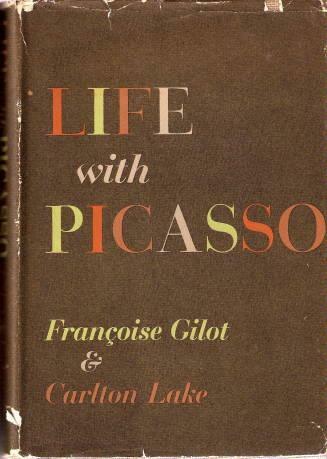 Recently, I found an early edition of Life with Picasso. 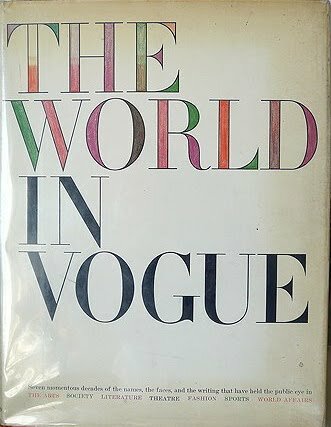 In true 1960s fashion, the first design is all about the graphic simplicity of multi-colored fonts. Later editions feature a striking photograph of author and painter Francoise Gilot with Picasso. 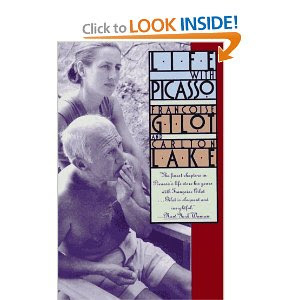 You're probably thinking, "Well, doesn't a picture of the subjects make perfect sense for Life with Picasso? Given the nature of the book?" It does. I'm just intrigued by the change in tastes and marketing strategies. 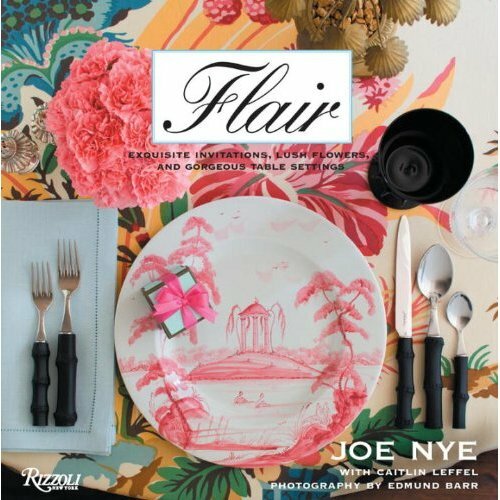 Covers without the people pictures offer a sense of mystery and temptation; we have to open the book to see which photographs, if any, were included. 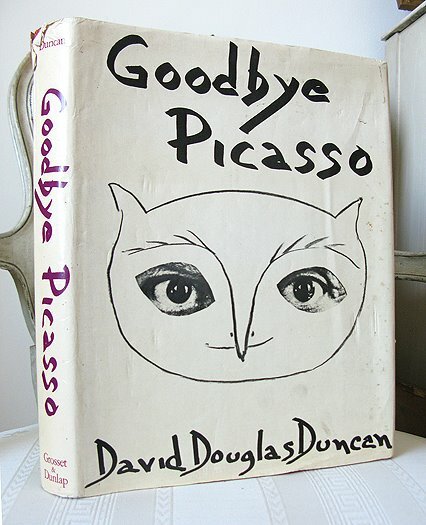 Again, the dust jacket for David Douglas Duncan's Goodbye Picasso is special because it was created using Picasso's sketchy self-portrait as an owl combined with Duncan's photograph. Under the dust jacket, the book was bound in jute dyed to match the background color from a Picasso portrait. (Images here.) Below are other book jackets that embrace letters. 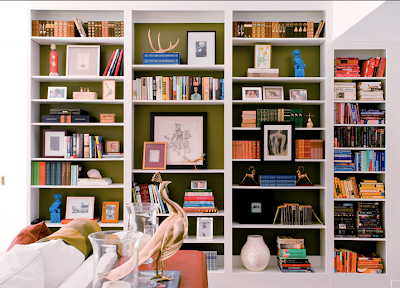 Of course, I've been using a magnifying glass to look at the bookshelves photographed by Tim Street-Porter in Rooms to Inspire in the City. As mentioned here, many of the houses and apartments included in the book are old favorites but we get to see new details, new perspectives. 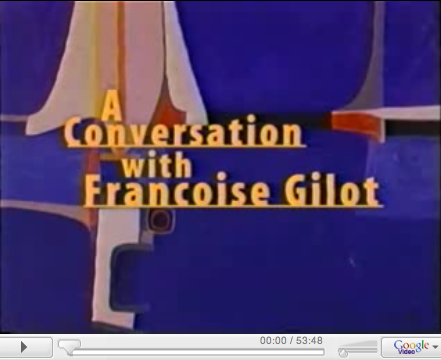 Charlie Rose's hour-long conversation with French painter Francoise Gilot, taped in 1998, is still available in the archives here. I'm mentioning it mainly because it was a really interesting program -- or broadcast as Charlie would say -- but I also want to draw attention to Francoise's necklace. 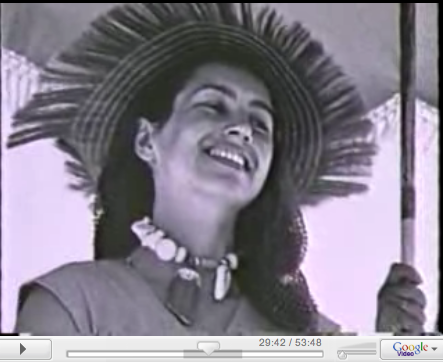 At one point during the broadcast, the camera zooms in on the famous Robert Capa photograph and it's possible to get a better look at what she's wearing. I'll leave it to you to compare and contrast the necklace in the 1948 photo with the variation recently spotted up for sale at Christie's. 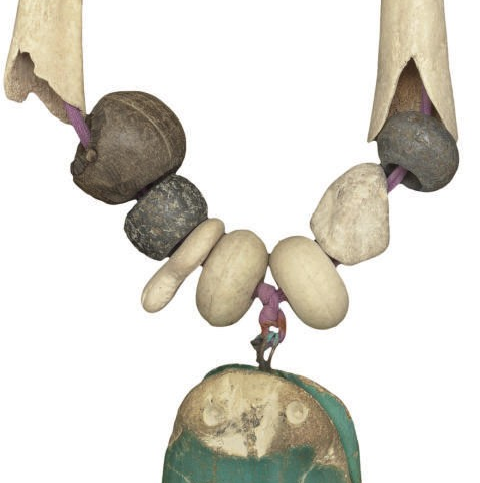 Again, the "Christie's" necklace shown directly above was a collaboration between Gilot and Picasso in 1948. 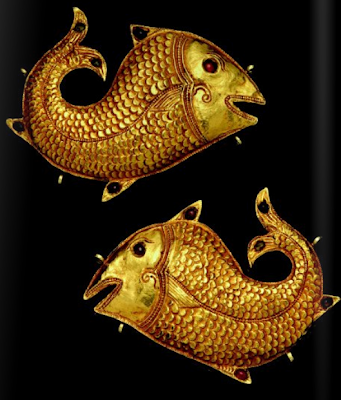 The "owl" pendant (read more about it here) seems to appear in Robert Capa's photograph but the configuration of stone beads and/or bone looks different. 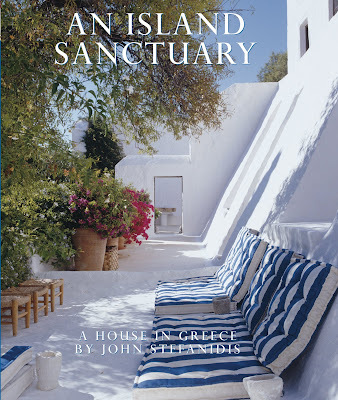 Last year when I saw the preview cover for John Stefanidis' new book, An Island Santuary: A House in Greece, I anticipated a lavishly illustrated tome that would offer some smart, tangible ideas but mainly give readers a chance to escape. Sort of the decorating equivalent of Giada's vacation specials. Respite from the vitriolic atmosphere we're all hit with every time we catch up on the news. Now, having read it, I have to say An Island Santuary goes far beyond escapism. 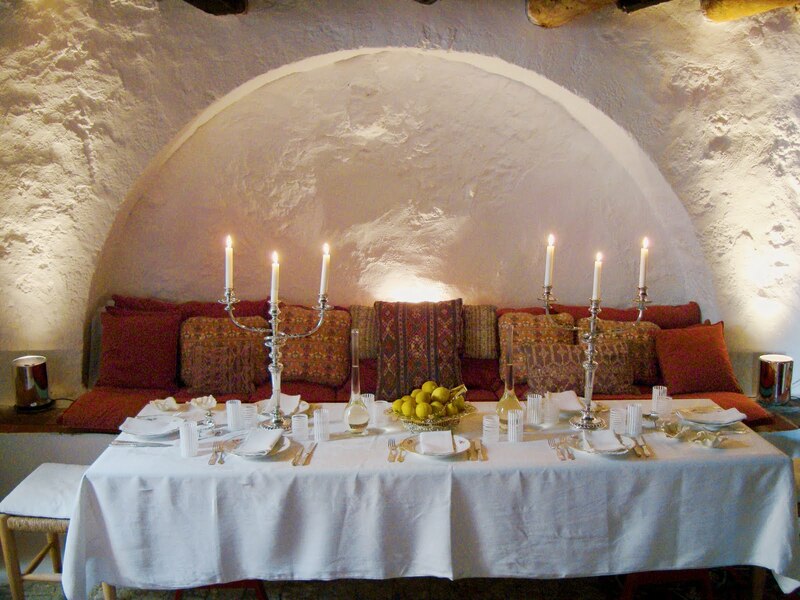 It's about how a house becomes imbued with the spirit of its occupant. 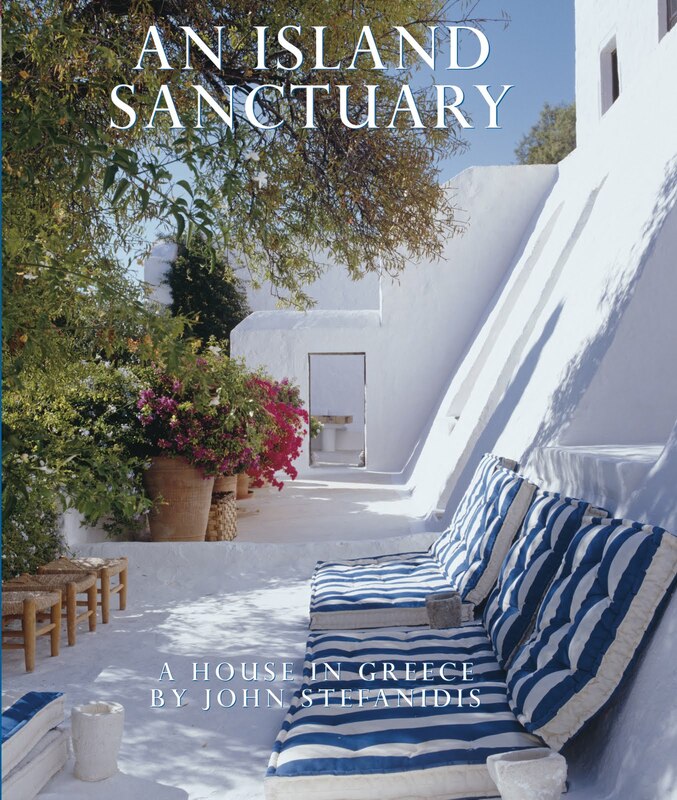 Susanna Moore, the Ernest Hemingway Foundation/PEN Award-winning author, contributes to the book too, covering the history of the Greek island and the restoration of the house and gardens. For architecture enthusiasts she includes details about the local stone, tile and other natural materials and she discusses construction. 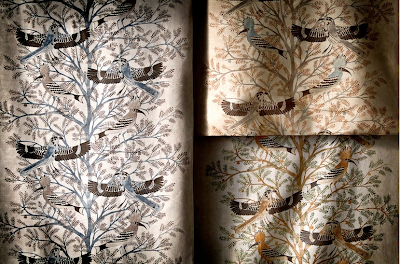 For me, as mentioned a couple of weeks ago, elements that really bring the book to life are the cotton fabrics and Millington-Drake's work. 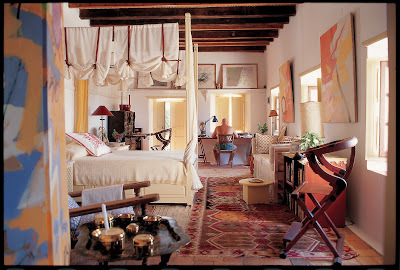 The guest bedroom, shown here at top, was once the late Millington-Drake's art studio. 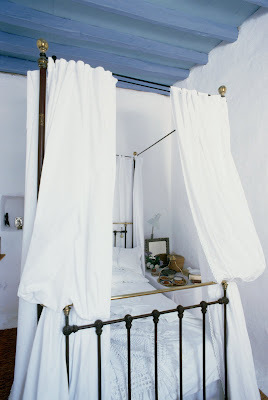 The four-poster Stefanidis-designed bed was made on the island and, as seen in image two, was painted an ecru shade known as "Dust of Paris." A red-lacquer Japanese barber's chair can be spotted in the foreground. 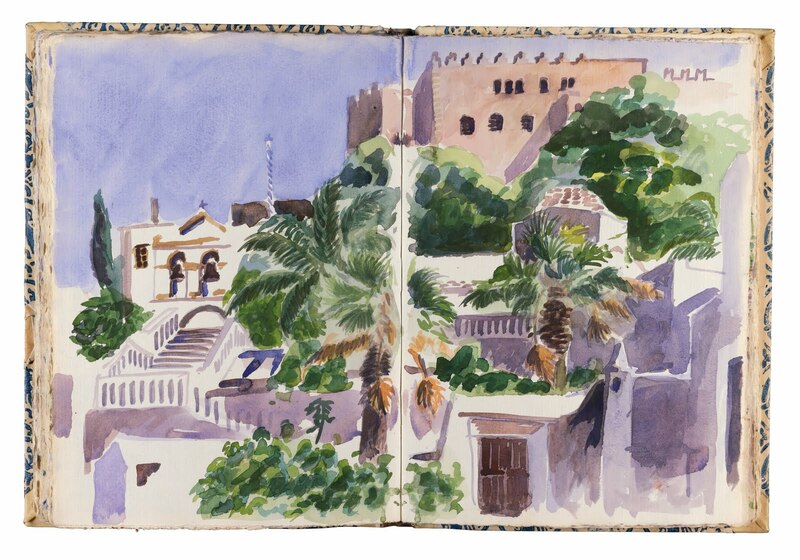 Lots of Millington-Drake's abstracts appear throughout the house, and his wonderful watercolor renderings of the island, the gardens and the interiors also add charm and layers of meaning to the book's pages. That said, if all you desire is a little escape, a little Fantasy Island, Fritz von der Schulenburg's photographs provide it. And there are other beautiful spring releases that we need to explore soon. 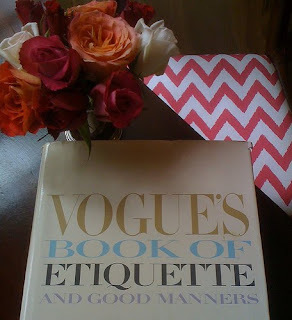 I expect to see them covered from different angles on many of my favorite blogs, such as The Peak of Chic. 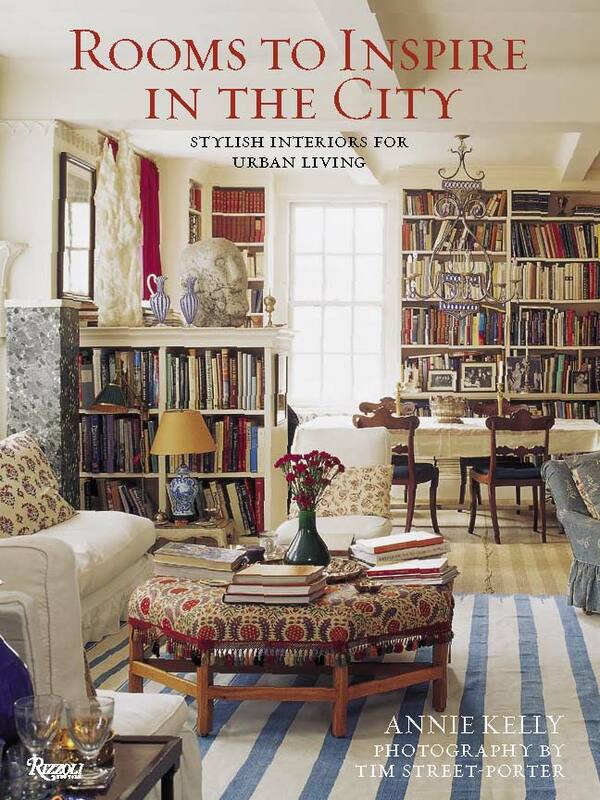 Annie Kelly's latest edition to the Rooms to Inspire series, Rooms to Inspire in the City, offers a different kind of respite (read a bit of a tease here). 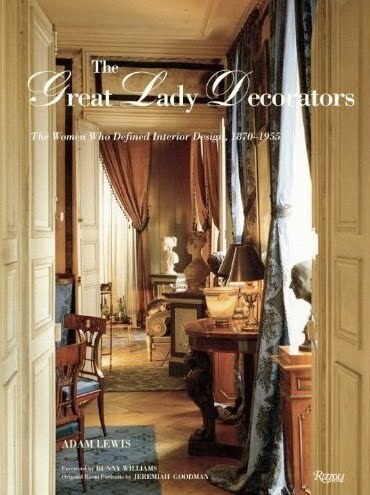 And Adam Lewis' The Great Lady Decorators is an amazing survey of 20th-century design that delves into the history of women in the workforce. If you aren't sure who Candace Wheeler is, or how she relates to interior decoration, you'll know after reading the book. 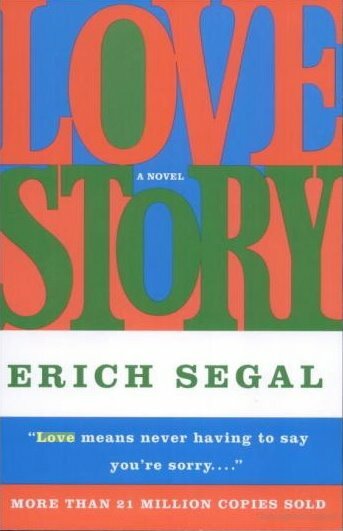 I think this one is a candidate for college libraries. Plus, room portraits by interiors painter Jeremiah Goodman and large photographs add appeal to the in-depth text. Every year, in anticipation of spring break or summer days, I find some excuse to post this Robert Capa photograph. 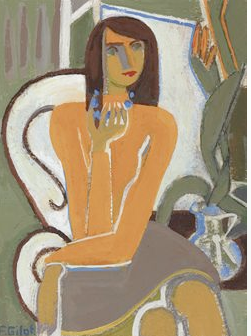 But to do it one more time feels like a bit much, so instead I'm offering examples of Francoise Gilot's work. 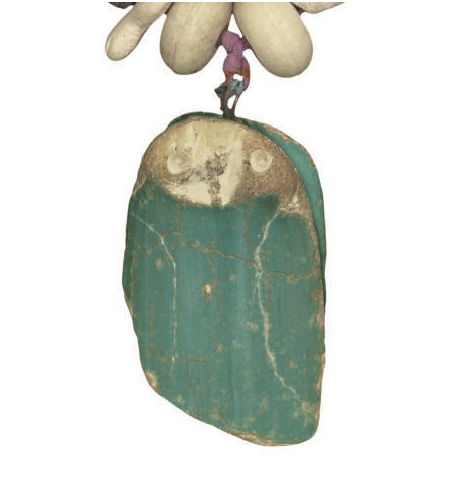 This owl necklace, sold just a few weeks ago at Christie's, was actually a collaboration between Gilot and Picasso in 1948. 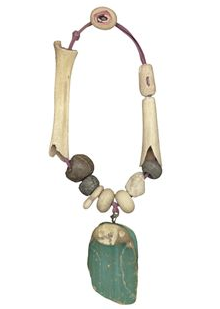 It is 15 inches long and includes a suspended carved stone pendant in the form of a colored owl joined to a purple cord with metal, bone and stone beads. 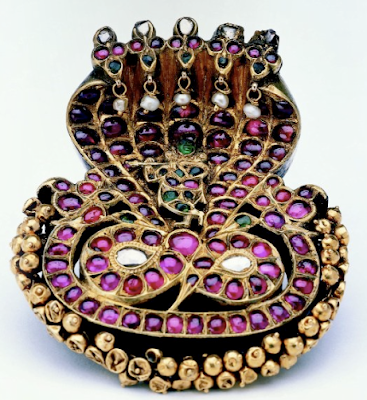 The oval shaped pebble clasp has a pink painted detail. 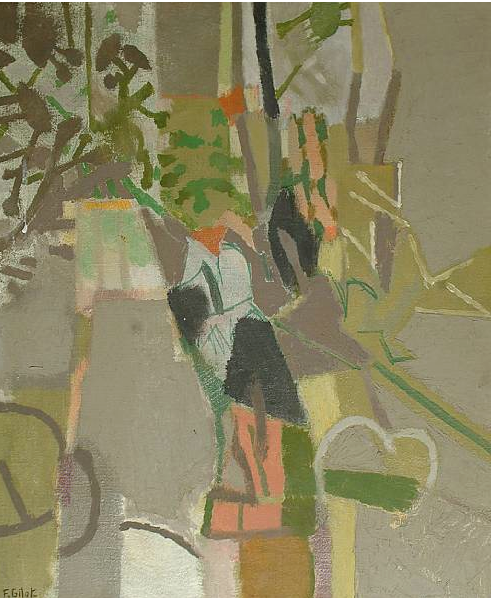 Above, another painting recently sold by Christie's, Gilot's Autoportrait avec Collier Bleu, a tiny oil on board (7½ x 5½ inches), painted in 1945. Gilot's abstract composition, an oil on canvas with citrus hues, was sold at auction by Bonhams in 2007. Since the Egyptian galleries at the Met provided Katie Leede with so much inspiration for her Ra fabric collection, I'm curious to see what designers will take away from the exhibition When Gold Blossoms: Indian Jewelry from the Susan L. Beningson Collection on view through July 11, 2010 at the Michael C. Carlos Museum in Atlanta. Visitors will be able to see more than 150 pieces of finely crafted jewelry representing 2,000 years of Indian creativity. Most of the objects are from South India where there has long been a focus on gold as well as plant and animal life. 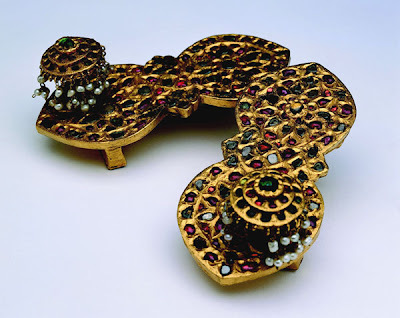 Jewelry for women and deities is at the heart of the Beningson Collection, hence the exhibition's three main areas of emphasis: Jewelers, Women (The Sixteen Adornments), and Deities. To learn more about special events related to the show, click here. 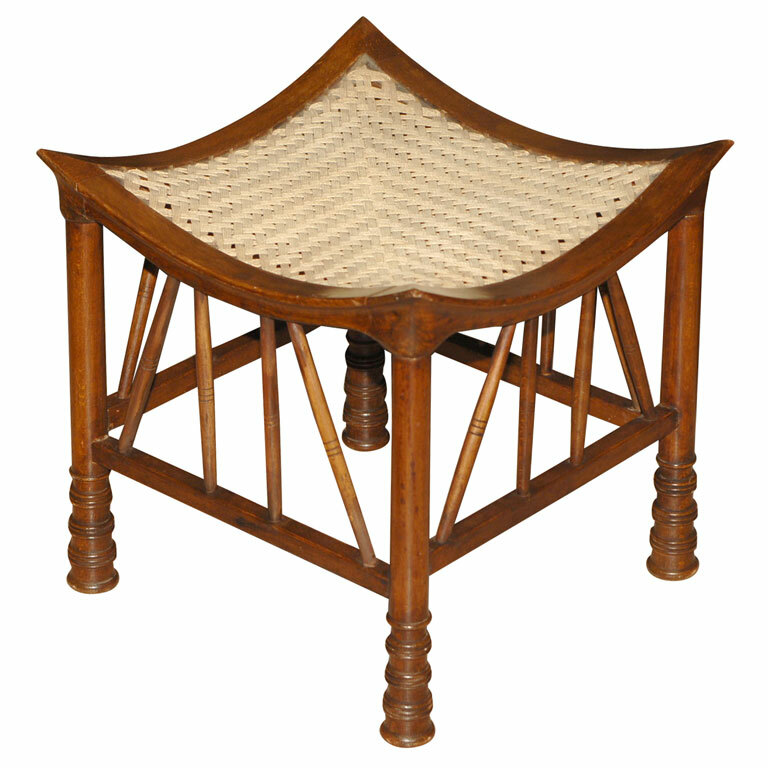 For general information, click here. Coleen Rider and Holli Thomas over at B and B have already written about Katie Leede and her Egyptian-inspired fabrics (check it out here) but I couldn't resist visiting the Met and making some connections of my own. 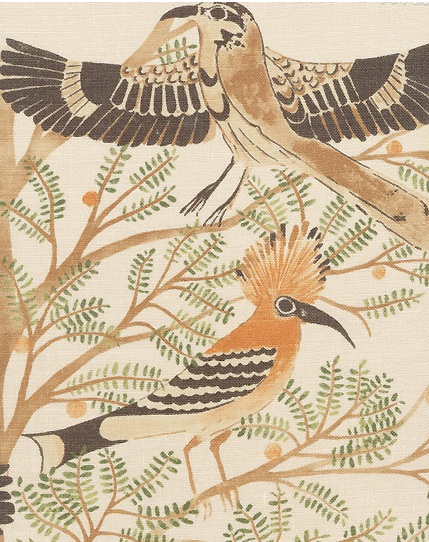 Shown here is Leede's Isis, a large-scale printed linen from her Ra Collection. I think the works below show similarities, especially in terms of color and line, between Egyptian art and Katie's fabrics. A Block from the Sanctuary in the Temple of Mentuhotep II at Deir el-Bahri, Middle Kingdom, ca. 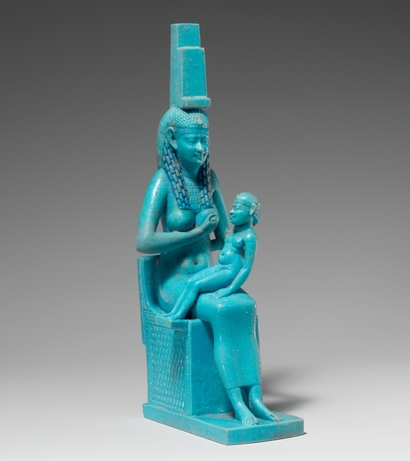 2010–2000 B.C., Gift of Egypt Exploration Fund, 1907, the Metropolitan Museum of Art. Nany's Funerary Papyrus, Third Intermediate Period, ca. 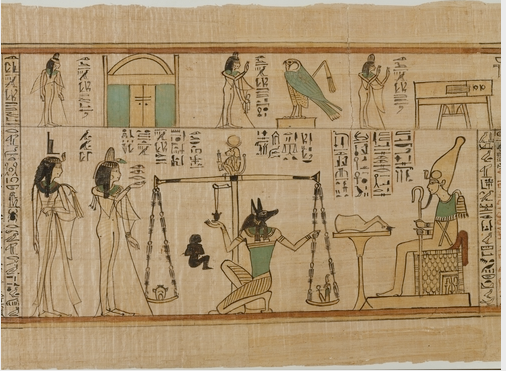 1040–992 B.C., Rogers Fund, 1930, the Metropolitan Museum of Art. Statuette of Isis and Horus, Macedonian and Ptolemaic Period, 332–30 B.C., Purchase, Joseph Pulitzer Bequest, 1955, the Metropolitan Museum of Art. 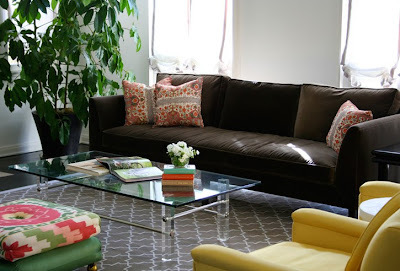 Be sure to take a glance at Digs by Katie, too. There are other rooms in Horst Interiors that I could have used to draw some literal comparisons between Molly Luetkemeyer's 21st-century work and iconic design from the 1960s and 1970s, but this picture of Gwendolyn Warner with her daughter captures a certain feeling. To me at least, it speaks cozy glamour. 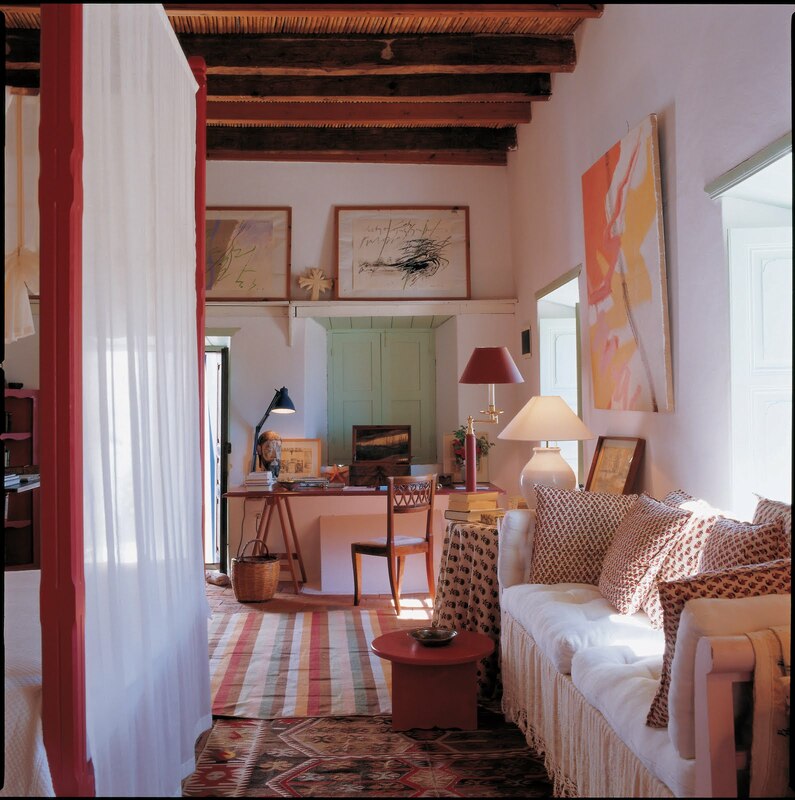 And, according to Horst author Barbara Plumb, many of the furnishings were chosen to be juxtaposed with Mrs. Warner's art collection. 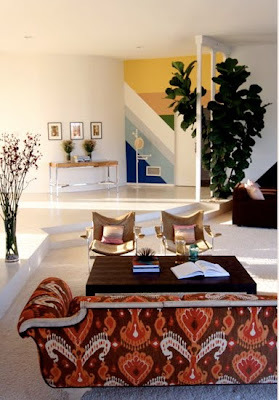 The black-and-white pillows relate to the Bridget Riley above the sofa, and a globe lamp and albino tortoise shell are said to be counterpoints to Jules Olitski's Juice. When her client doesn't have art but wants to start a serious collection, Molly usually suggests an art consultant. Her go-to women in Los Angeles are Sarah Cohen of mixed media consulting (scohen@mixedmediaconsulting.com) and Cardiff Dugan Loy (cardiffloy@mac.com). 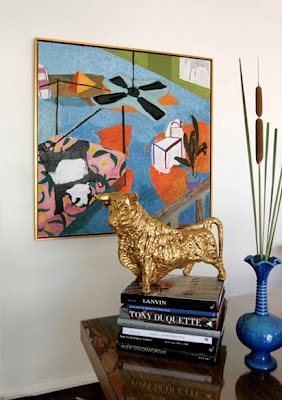 That said, when Molly works with clients who don't have a big zeal for art, she still encourages them to consider various types of prints, accessories that serve as sculptural elements, or sometimes even a graphic, decorative painting on a wall. 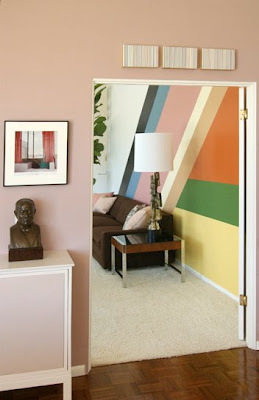 For example, the bold diagonal and horizontal stripes pictured above are simply intended to be decorative (although art history enthusiasts may be reminded of Sol LeWitt or Bridget Riley). 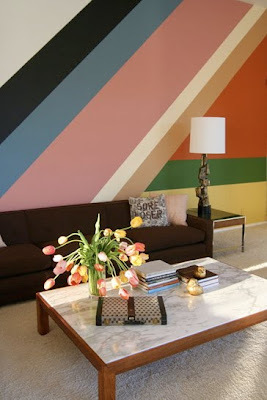 Since she wasn't attempting to pass the stripes off as a Sol LeWitt, Molly felt free to use them as an enormous unifier, deftly echoing colors from all of the fabrics and furniture throughout the madeover 1960s Bel Air house. "Stripes are pretty easy to paint," she explains, "because you just tape off the lines and then run a bead of caulk along the edge (to prevent bleeding) and then paint right over it. Once the first color is dry, remove the paint and tape along the edge of the already painted stripe, add the caulk and repeat. It’s the best way I know to get super-crisp lines." 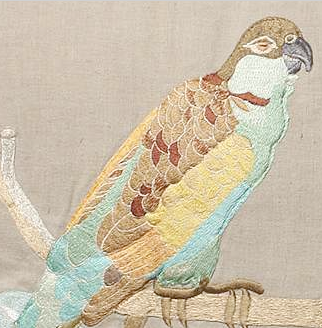 Textiles are another passion of Molly's and she's never timid about stratigically using them to punch up a room. 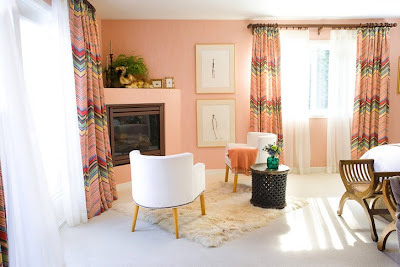 Check out the chevron stripe she used at the windows in her sister's master bedroom. 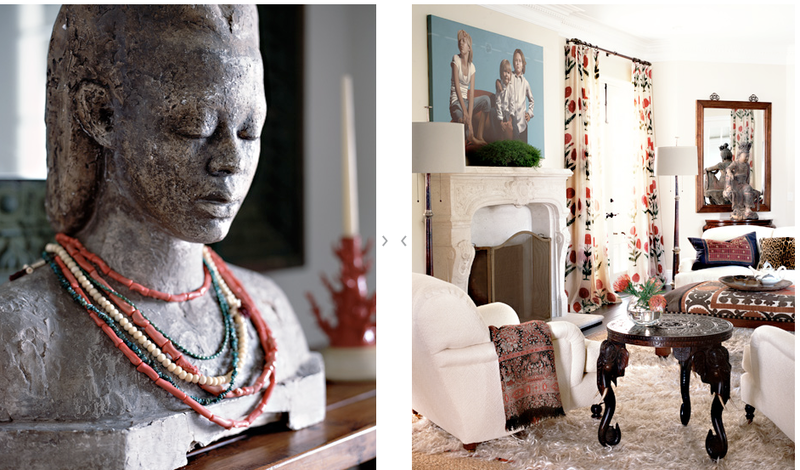 Also, as mentioned the othrer day, different views of this house are in the April 2010 InStyle (the Modern Mom story about Molly and sibling Julie Bowen addresses kid-friendly fabrics, among other things). And the interior designer is working on a fabric line of her own, so there's much more to look foward to. For other thoughts on collecting art, see Angie's Sources and Collecting. Try 20 x 200 for affordable, good quality prints from a batch of really interesting artists. 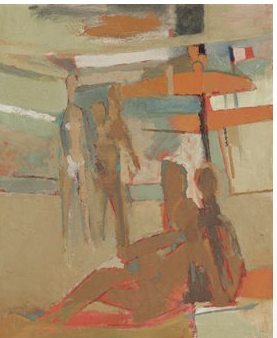 And, alternatively, if antique paintings and drawings are your cup of tea, never discount auctions -- surprisingly attainable pieces often show up there. 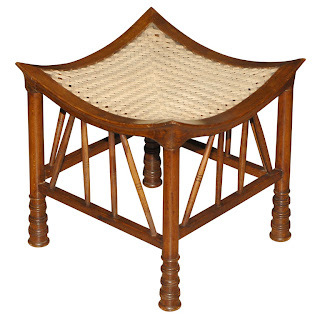 Related past post: Lived In.